Dilute Magnetic Oxides exhibit room temperature ferromagnetism whose origin is still unclear in most cases. 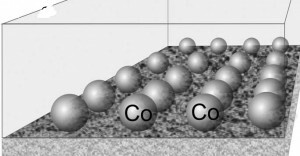 In Zn1-xCoxO the occurrence of ferromagnetism can be associated to the concurrent presence of defects formed by oxygen vacancies close to Co atoms (Co-Vo complexes) and charge carriers. A qualitative picture explains the long-range ferromagnetic coupling of the Co atoms involved in the Co-Vo complexes. We also investigate the effects of hydrogen irradiation on ferromagnetism and carriers of Zn1-xCoxO samples . The growth of thin films of nanocomposite materials by pulsed laser deposition indicated a route to synthesize metallic nanocrystals with well-defined position in a semiconducting matrix. By proper selecting process parameters and materials it is possible to assemble on demand composite multifunctional materials at the nanoscale for reliable magneto-optical and plasmonic applications.